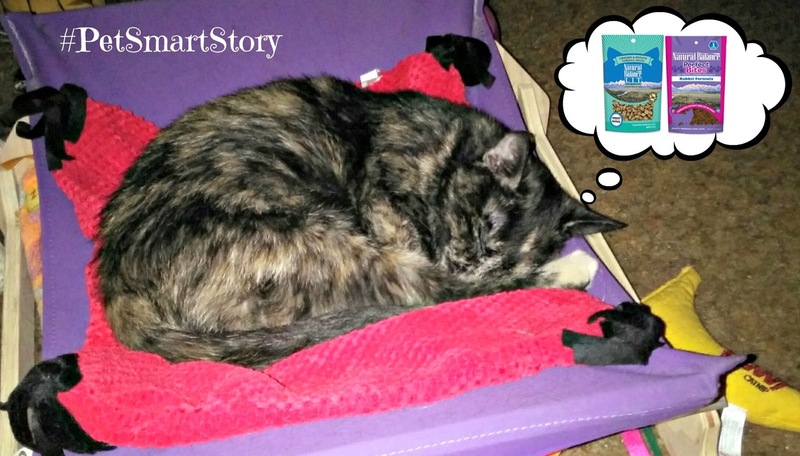 This post is sponsored by PetSmart®, and the BlogPaws Professional Pet Blogger Network. I am being compensated for helping spread the word the word about the launch of Natural Balance® products at PetSmart, but Mochas, Mysteries and Meows only shares information we feel is relevant to our readers. PetSmart is not responsible for the content of this article. Miss Mudpie has been with me exactly one month today, and I'm so proud of how my little girl's tastes have expanded in such a short time. You might remember that in the very beginning I wasn't exactly thrilled with her not-so-healthy food choices, and I was on a mission to find her healthier foods that she would enjoy and I would be happy feeding her. 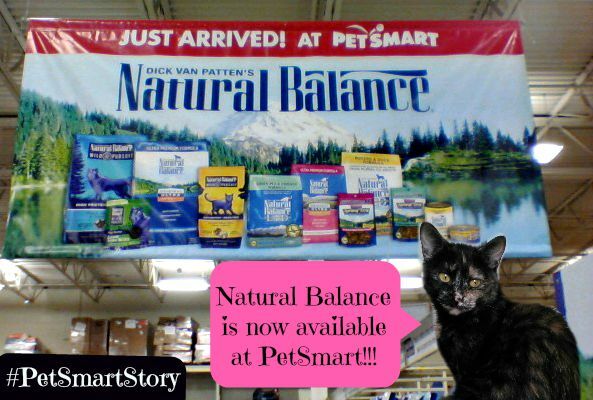 This made the arrival of Natural Balance® pet products in PetSmart® stores such an exciting time. One of the things I've always loved about Natural Balance is the huge variety of premium pet foods they offer. Variety is the spice of life, right? Our cats don't want to eat the same thing meal after meal, day after day, any more than we do. They need different textures, flavors and formulas to keep boredom at bay and most importantly to ensure they're receiving optimum nutrition through every life stage. Thanks to Natural Balance's formulas: Original Ultra®, Wild Pursuit™, L.I.D.®, Weight Management, Pouches, and Stews, your cat has a wide variety dry and canned foods, stews, and treats to choose from. Now PetSmart is your one-stop shop for all of the exciting lines Natural Balance has to offer...here are a few of our favorites! * When I opened a cup of Delectable Delights® Cat Stew Formulas for the very first time, I could't help but think that it looked like an appetizer for humans! Hand crafted and cooked to savory perfection and with fun flavors like Catatouille, O'Fishally Scampi, and Sea Brûlée, these stews will definitely tempt your cat's taste buds! * L.I.D. Limited Ingredient Diets® is designed with a limited number of protein and carbohydrate sources for cats with sensitivities to common ingredients. They are designed to support healthy digestion and to maintain skin and coat health while providing complete, balanced nutrition for all life stages. * Original Ultra® Whole Body Health nourishes your cat's complete well-being by taking an entire body approach. Truffles and I blogged about this line of food back in October and she continued to eat it on a daily basis. Now it's a regular part of Mudpie's diet! * Wild Pursuit™ features high protein, grain-free nutrition from diverse and balanced sources, and is developed to meet the fundamental needs of cats by closely resembling the diet they would have eaten in the wild. Freeze dried raw pieces are actually mixed in with the kibble! Their Perfect Bites® treats come flavored in chicken, rabbit, and salmon, and the L.I.T. Limited Ingredient treats are oven-baked and come in chicken & potato, rabbit & potato, and salmon & potato. Mudpie can't wait to try them all! PetSmart already has an unparalleled selection of quality pet products, so the ability to pick up our favorite Natural Balance items during my regular shopping trips is just icing (er...catnip) on the cake! Does your pet already have a favorite Natural Balance food? Anything you're still looking forward to trying? Callie says that there are still a LOT of things from Natural Balance that she'd like to try. Especially some of those wet noms. Those look really tasty! 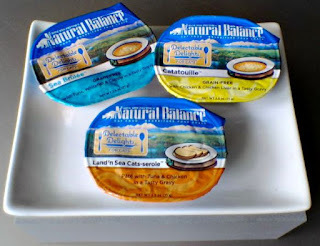 My kitties both love the Natural Balance wet food Bailie brought home for them from PetSmart. We love the Natural Balance Platefulls! Glad to see high-quality, Natural Balance pet food is becoming more readily available. Looks like Mudpie licked her bowl clean! Happy one-month anniversary, Mudpie and Mommy! I'm glad Mudpie is getting healthier eating habits! Here in Portugal we don't have Natural Balance products. Natural Balance does make some nommy foods. Oh those sure do look good. My cats even like to lick the Delectable Delights for dogs...LOL. All weez twied awe da pate's we got at BlogPaws, and weez not like them. But weez not like anypawdy's pate so it came as no surpwise to mommy. Weez not have a Petsmawrt eever, so unless weez get a offer to blog fur them weez purrobly won't be gettin' to twy any of these. they do sound pawsum tho' and weez so glad Mudpie's palette has impurroved. Have a gweat day. I'm so glad that Mudpie has found a healthy food that she likes! She's such a cutie and she deserves to be as healthy and happy as possible. My kitties enjoy the Platefulls formulas from Natural Balance. They tell me that the Platefulls meals are delicious!